I used to think Figaro had the best tuna sandwich in town. They called it Grilled Tuna Cheese or something. I loved the bread, I loved the mustard, I loved the potato chips on the side. 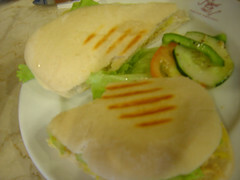 My dad and I were craving for it last week so we went to Figaro, ordering the sandwich excitedly. They changed the bread, there was no mustard, no potato chips, and the cheese reminded me of the cheese one normally finds in a Jollibee Yumburger with Cheese. They changed everything I loved about that sandwich! It’s a completely different sandwich altogether! I didn’t use to grumble about the cost of that tuna sandwich because it tasted just so damn good. I’m grumbling now. The sandwich is no longer worth the price. I’m going back to get a feedback form or something. I am not happy with this development. That doesn’t look so bad… why’d they change it to pita bread though?